Peter Meinke, Poet Laureate of St. Petersburg and Professor Emeritus at Eckerd College has published 15 books of poems, two books of short stories, and currently collaborates with his artist wife, Jeanne Meinke, on a bi-weekly column, Poet’s Notebook, for Tampa Bay’s alternative newspaper, Creative Loafing. Peter and Jeanne’s latest collaboration is The Shape of Poetry: A Practical Guide to Writing and Reading Poems. In it, Peter discusses the value of poetry in general, formal poetry in particular, and Jeanne has added 18 drawings of writers. Peter Meinke will be one of the guest speakers at the 2013 Eckerd College Writers’ Conference: Writers in Paradise. Jay Baron Nicorvo’s debut collection, Deadbeat, revolves around a central character of the same name—an absent father and husband, and the family that goes on without him. An effigy for America and our culture of recession, Deadbeat is brought to life with honesty, sympathy and love in all of its complications. Jay is an alum of the Eckerd College Writers’ Conference: Writers in Paradise. Melanie Neale grew up living aboard a 47′ sailboat with her parents and her sister. The family traveled the US East Coast and the Bahamas from the mid 1980’s to the end of the 1990’s, and both daughters were home-schooled until they went to college. Melanie began writing poetry and short stories when she was a young child, and she earned a Bachelor of Fine Arts degree in Creative Writing from Eckerd College in 2002 and a Master of Fine Arts degree in Creative Writing from Florida International University in 2006. She lived aboard her own 28′ sailboat while in graduate school in Miami. She has taught college, captained and crewed on boats, detailed boats, worked in a bait shop, worked in marketing, and currently works as the Director of Career Services for a private art college in northern Florida, where she lives with her husband and daughter. Melanie is an alum of the Eckerd College Writers’ Conference: Writers in Paradise. 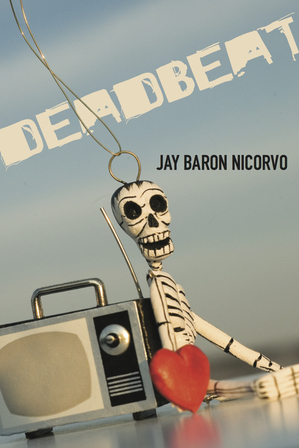 Congratulations to Eckerd College Writers’ Conference alum Jay Baron Nicorvo whose collection of poetry, Deadbeat, is now available! Deadbeat is published by Four Way Books. You can buy Deadbeat via the usual places such as Amazon and Barnes & Noble, but you can also purchase direct from Four Way Books where it is currently on sale for 32% off the original price..
Congrats to ECWC alumna Melanie Neale McLendon whose memoir, Boat Girl: A Memoir of Youth, Love & Fiberglass was recently published by Beating Windward Press. Below is the press release from Beating Windward Press. Beating Windward announces the publication of Boat Girl: A Memoir of Youth, Love, & Fiberglass by Melanie Neale. Boat Girl is a 246-page memoir and was published in September of 2012. Boat Girl: A Memoir of Youth, Love, & Fiberglass is the engaging and heart-breaking memoir of what it’s like to grow up aboard a sailboat. Throughout the 1980’s and 90’s, Melanie’s family lived aboard a 47-foot sailboat, spending their summers along the US East Coast and their winters in the Bahamas. But the cruising life was not all fun in the sun. The family had to work hard to pay for their way of life. They dodged hurricanes, overzealous federal agents and bullying land-kids, and they endured a boatload of family drama. As her father published articles about how living on a boat brings families together, Melanie secretly struggled with an eating disorder, the alienation of being a boat kid, and confusion over her developing sexuality. As an adult, she lived aboard her own 28-foot sailboat and went through several relationships looking for someone who wasn’t intimidated by her stubborn independence and free-spirited lifestyle. 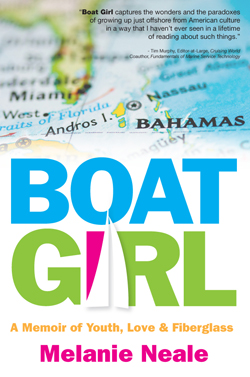 Boat Girl weaves all this together into a story about a girl who, once all is said and done, simply wants her own boat and the freedom to live her own life. Melanie paints a vivid picture of the trials and tribulations of family life aboard a sailboat without drowning the reader in the technical details of sailing. Boat Girl strikes a perfect balance between coming-of-age story and sea tale, enjoyable for boaters and land-lovers alike. There are dozens of books about “boat families” written from the parents’ points of view and one or two books actually written by boat kids, but none that capture the entire childhood experience and its lasting effects. Melanie lived aboard her parents’ boat for nineteen years, from birth to leaving for college, making Boat Girl a unique addition to both sea tales and coming-of-age stories. 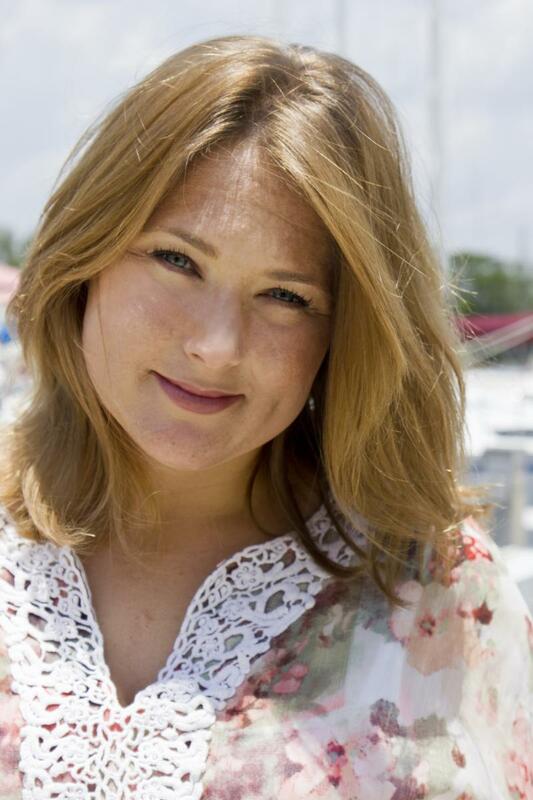 Melanie Neale holds an MFA in Creative Writing from Florida International University. She currently works as the Director of Career Services for a private art college in northern Florida, where she lives with her husband and daughter. Melanie’s fiction, poetry and nonfiction have been published in many literary journals and magazines, including Latitudes & Attitudes, The Georgetown Review, Soundings, Seaworthy, Southwinds, GulfStream, The Miami Herald’s Tropical Life Magazine, Balancing the Tides, RumBum.com and Florida Humanities. Her “Short Story” column appeared bimonthly in Cruising World Magazine from 2006 to 2009. Boat Girl: A Memoir of Youth, Love, & Fiberglass is her first book. Beating Windward Press is an independent publisher of novels, short story collections, and non-fiction by emerging authors. They produce 4 to 6 titles a year and the books reflect the individual tastes of the small staff – mostly mainstream fiction with a literary edge. Congrats to ECWC alum John White who recently won first place in The Grey Sparrow Journal, Flash Fiction Competition, which included publication in the Fall issue. For submission guidelines to The Grey Sparrow Journal, please visit their website. You are currently browsing the Writers in Paradise Alumni blog archives for October, 2012.